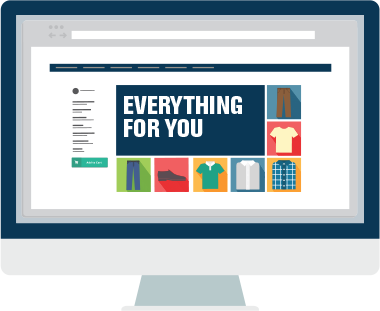 Personalize each shopper’s website experience with messaging based on where they fall in the customer journey. Did this customer abandon a cart on a previous visit? Display the abandoned item. 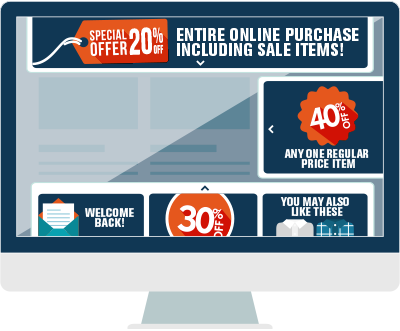 Has this customer browsed your website multiple times without making a purchase? Offer free shipping. Is this a customer who hasn’t engaged with your brand in a long time? Offer a discount on their next purchase. You determine the rules for personalized messaging based on where each customer falls in the journey, optimizing both revenue and the customer experience. Use a variety of lightbox shapes and sizes with optional minimize/maximize functionality, or choose to use Engagement Bars (see below). Lightbox placement options include floating center or anchored to the side or top. All lightboxes use API to ESP Integration. 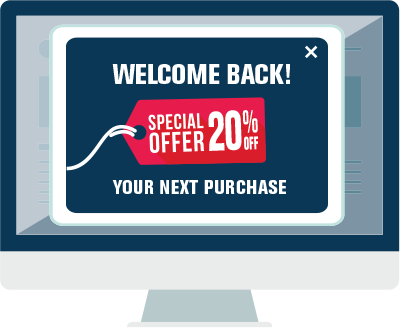 Acquire new customers and bring back the old with Sign-Up and Opt-Back lightboxes. Email Sign-Up Lightbox: Automatically display a sign-up lightbox to website visitors not already on your master email list, triggering a Welcome email when they sign up. 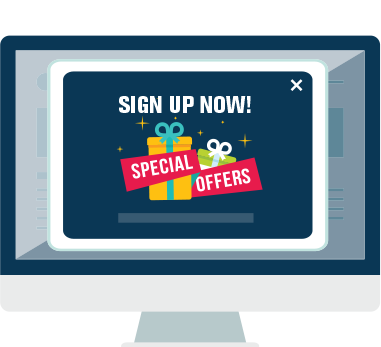 Opt Back-in Lightbox: Automatically display an invitation to re-subscribe to website visitors who previously opted out of your subscriber list, triggering a Welcome Back email when they sign back up. Our advanced email verification and inbox validation ensures email addresses are valid before accepting them. Our versatile Engagement Bars remain visible as shoppers navigate your site, and can be minimized and maximized as desired. Display creative at the top, bottom or side of your web pages. Display real-time product recommendations and offers unique to each customer, determined instantaneously using a shopper’s past and current interests combined with browse and purchase data from shoppers with similar interests. Minimal creative is needed because the content is dynamically populated. 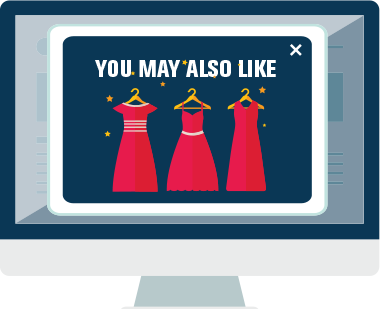 For the ultimate personalized website shopping experience, customize each visitor’s view of your website to their interests. Does this shopper usually shop for men’s clothes? Then the first thing seen can be men’s clothes. Use your current site optimization and customization software to alter each user’s experience based on a vast array of data and insights available through the Consumer Insights Interaction Hub™.